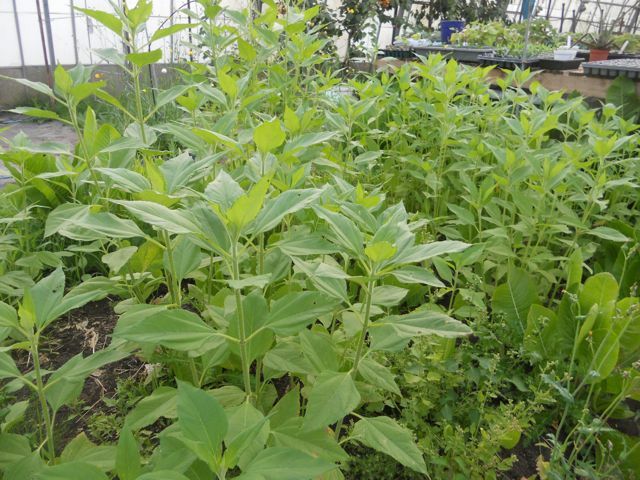 Whether you are an experienced allotment grower or keeper of livestock, or just have an aspiration to grow a little more food for your family, you will probably be interested in how other like-minded people do their thing. 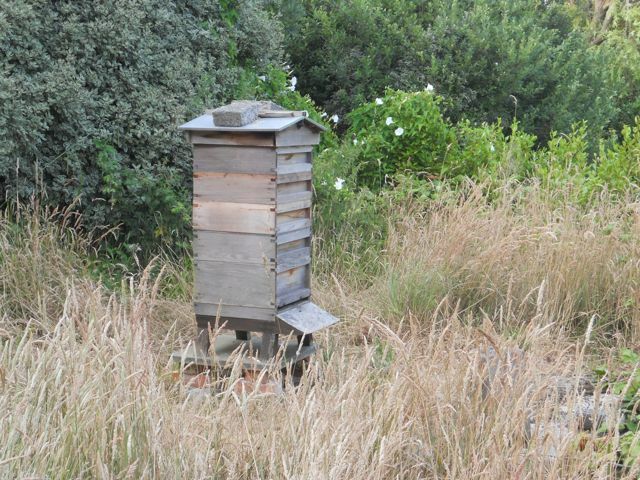 On this page we will be gathering together short examples of how some Guernsey Smallholders' members and friends fulfill their own desires to supplement the food they buy with food they produce themselves. At John's suggestion, they took on two adjacent plots instead of just one (in for a penny) and set about clearing the site, which was full of dock with a threatening clump of Japanese Knotweed looking on from the boundary. They cut down the vegetation and removed as much of the invasive roots as they could, and got a friend to turn over the soil with a tractor. The battle against perennial weeds continues, but we have to accept this as part of the deal - isn't it a great source of satisfaction when you look back over the patch you have just weeded? 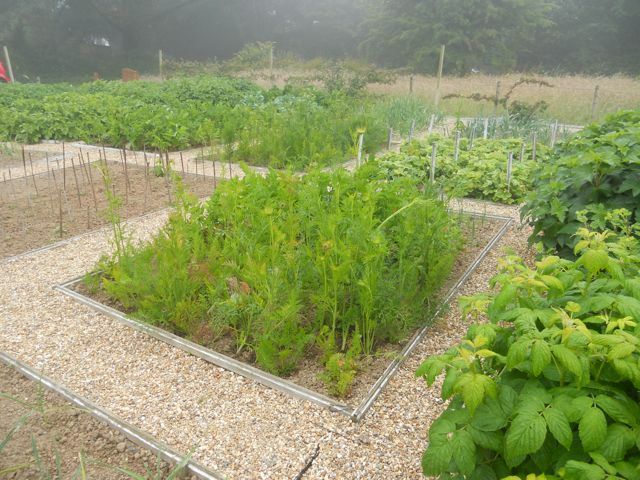 The separate beds are marked out with old greenhouse timber, and the paths have a lining of Mypex weed suppressing membrane, which Sarah managed to pick up for nothing. They spent on gravel for the paths, but it looks like this was a worthwhile investment - it is not only totally functional, but looks great. There are gooseberries and currants in a bed together, and raspberries, tayberries and thornless loganberries grown from donated canes - these are trained along the wire fence running along the edge, where their vigorous and unruly growth can be controlled. Logans and tays are both blackberry/raspberry crosses and they are clearly happy in the full sun and well drained soil of this allotment. 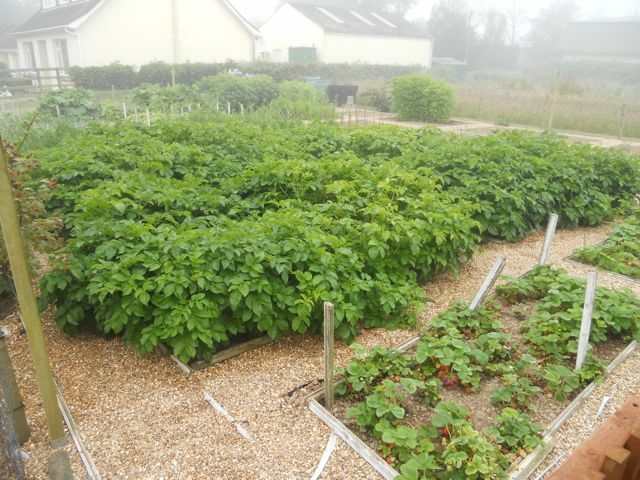 There is also a bed of large strawberries, and a second bed of young strawberry plants taken from last year's runners - the original plants are now three years old, and as the yields will soon drop off, they will be replace with the youngsters. But what about water? 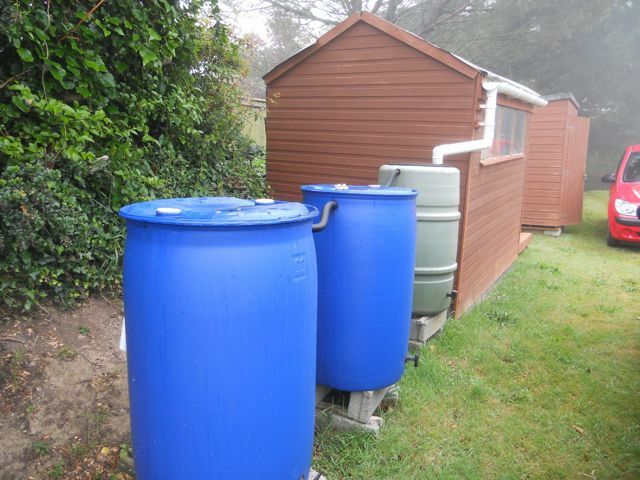 John has rigged up a row of water butts, which are fed from the small shed roof - as one fills up, it overflows into the next, so every drop is saved. 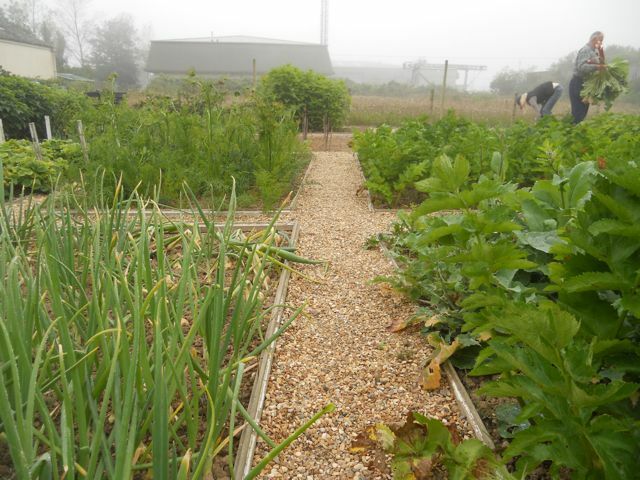 This is a well run, busy and attractive allotment, which just oozes the care and enthusiasm of its tenants. Sarah uses a corner of one of the family fields near the Forest cliffs. With eager help from her son Louis, she keeps a few dozen chickens, ducks and geese, all totally free range, with Border Collie Poppy helping to make sure there are no strays. The field is partly kept as meadow for hay, with a large area on one corner reserved for the birds, which have access to lots of space, coming and going pretty much as they please. Sarah tried setting up an allotment area nearby, but was fighting a losing battle against the ever-present wind whipping in off the cliffs, and large numbers of rabbits constantly testing her defences. She's given up and moved into a good sized greenhouse attached to her home, growing salad and veg crops, herbs, fruit and lots of flowers. The chickens, ducks and geese mingle easily alongside each other, as there is plenty of space. There are Light Sussexes, Vorwerks, Cochins, Andalucians, Friesians and some impressive Muscovies. The other ducks are white domestics, most likley a hybrid of Aylesbury and Pekin, and Khaki Campbell crosses, and the geese also are white domestics hybrids. The birds have lots of buckets and bowls for water, with a couple of paddlng pools for the occasional swim. Nesting is available under the trees and in a few small re-cycled sheds, with some fenced off pens for broodies etc. Sarah feeds layers' pellets and wheat in equal measure, with regular treats of mealworms. Being free range, all the birds are able to search for additional natural feed in the grass. Sarah has been keeping poultry for nearly six years and enjoys providing as free an experience for them as possible. She keeps them mainly for enjoyment, but is able to sell eggs to family and friends to supplement the costs of feed etc. - the birds don't pay their whole way, but Sarah doesn't see this as a problem as they are a hobby, as opposed to a business. In addition, she likes to engage is some bartering or exchange where possible, such as in payment for help given or produce supplied. As with other smallholders, Sarah values the mutual support of like-minded friends and neighbours who understand what's involved in rearing animals, and can give advice, or lend a hand to each other when the time comes, such as when it's necessary to dispatch one of the birds. This can be unpleasant to some of us, and must be done by someone who is confident and efficient in the process, so as not to cause any unnecessary suffering to the bird - fortunately Sarah has a friend who can help. Stefan does livestock. He keeps cattle, sheep and goats, and until recently pigs as well. And he's seventeen years old. 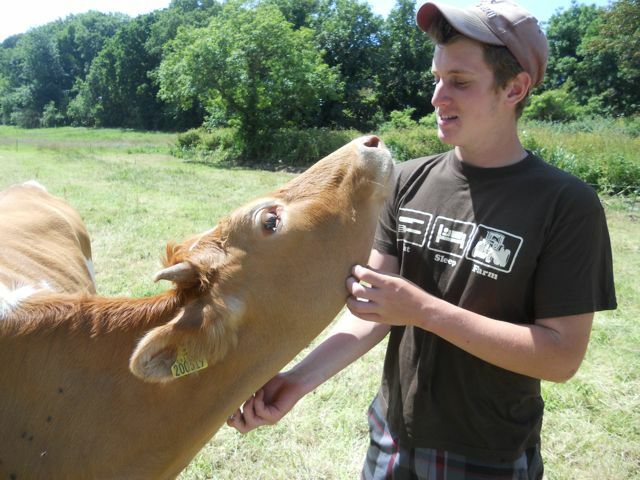 Since his early teens, Stefan has been keen to raise animals, and if all goes well, to run his own farm some day. By helping out at other smallholdings and farms, Stefan has gradually learned the skills needed to successfully raise livestock for food, and now cares for his animals on his own. He has numerous fields dotted around the island, either paying a fee or keeping the hedges and streams clean in lieu of rent - he doesn't own a scrap of land, but through spreading the word and making contacts, he has succeeded in acquiring all the area he needs to cater for his animals. Veal has had a bad name in past years, due to the now banned practice of raising veal calves in crates. But these young cows are raised to eight months, in the open, on grass, and with additional feed supplements. This means they will produce pink meat rather than white, and will be more tasty than younger veal. A few fields away is a small flock of sheep, mainly Welsh Lleyns, and Stefan has a larger flock of Jacobs at another site - he plans to reduce his Jacobs as they are not as productive. The Lleyns are known for being good mothers, regularly producing two lambs, and for their good nature and quality white wool. Stefan also keeps a few goats, and has supplied Golden Guernsey kids locally and to Alderney. Up at the crack of dawn, Stefan does his rounds, checking and feeding the animals until time for school, or in the holidays his part-time farm job, and then later in the afternoon going round again making sure his charges are fed, watered and safe. He has four heifers at the moment, all around one year old, which he will use for milk next year once they have calved. He has raised them from birth, so they are very comfortable around him. Stefan is going to buy himself a portable field milking machine and cooler, as he has no milking parlour, which means he can milk outdoors and cool the milk without any delay. Stefan has a bull calf that looks like it has the potential for breeding, and a few steers that are destined for rosée veal. By selling the meat he produces to friends and family and at farmers' markets, and raising extra funds from sheep shearing and part-time work, Stefan has managed to finance his hobby and to make some profit - he has recently acquired a tractor, which will enable him to carry out the more heavy-duty aspects of land management. In the next few years, Stefan hopes to complete an agricultural college degree course, and possibly to gain experience working for family friends on farms in the USA and UK. Whatever happens, he aims to fulfil his wish to run his own farm - he has certainly shown commitment and dedication thus far, and if that is anything to go by, this inspiring young man is going to be a farmer. It's definitely a joint effort round at Claire's. She lives in a house with a huge former carnation greenhouse in the back, which was full of wires, pipes and plastic sheeting when they moved in four years ago. Together with husband Martyn, son Colin and his wife Sarah they set about clearing the left over fixtures and fittings, and started creating what is turning out to be a perfect site for home produced fruit, veg and poultry. It is open, organised and all under cover. 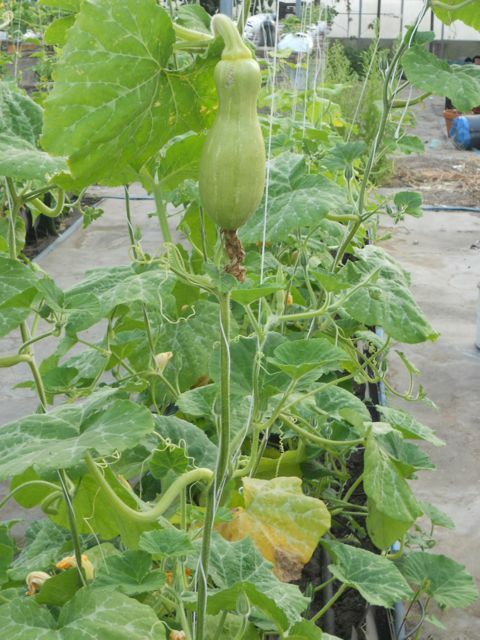 A large area at the front of the greenhouse is reserved for growing - there are butternut squashes and cucumbers climbing up from long troughs left over from the previous occupiers. Claire fills these with fresh compost each year as they are relativley shallow, but looking at the results, the plants are very happy in them. 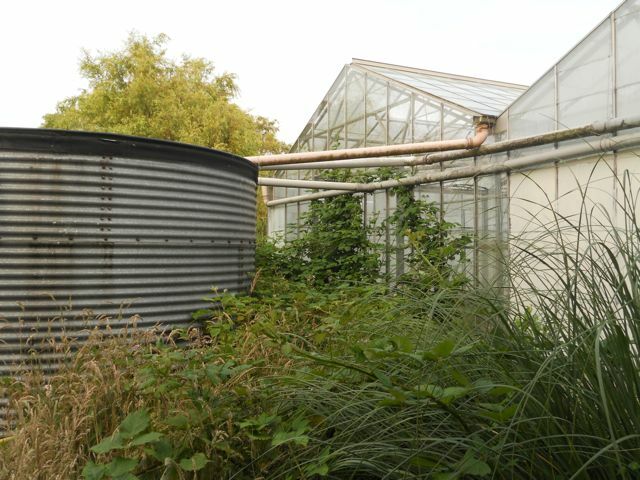 All the vegetables are watered automatically - Colin and Martyn have rigged up a system using the existing carnation irrigation pipes, all fed from a barrel set up high so that water is delivered to all the troughs and pots with little human effort. Linked to a timer, the watering can be set as needed. Sorted. Next to the squashes are rows of scarlet-flowered climbing beans growing over an old polytunnel frame, a healthy bed of Jerusalem artichokes and horse radish plants that refuse to stay within their allocated space, a productive apsaragus bed that had already delivered this year's crop and was being rested, and a large area devoted to Sarah's pet project - strawberries. 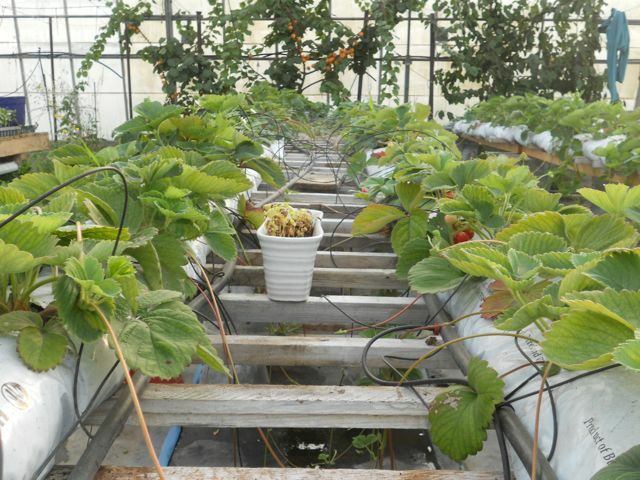 Sarah has made use of the metal pots left in the greenhouse, stacking them three-high and using old greenhouse timber to make racks on which are set grow-bags holding the strawberries. This not only means that they are comfortable to work on and pick, but is designed to keep them a little further out of reach from toddler fingers - although I suspect that last bit doesn't work very well. 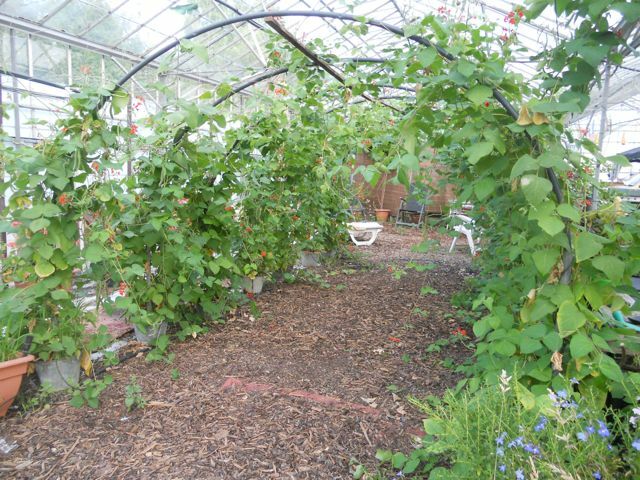 Alongside the strawberries, growing up the greenhouse fronts are fruiting peach and nectarine trees, and nearby are four healthy looking grape vines that tend to produce more foliage than fruit - an issue Claire will look into when there's some spare time. Colin's efforts are mainly directed towards the poultry, kept in the bottom half of the greenhouse. There are separate pens holding turkeys, Light Sussex chickens kept for eggs, and an experiment in breeding where Colin is crossing a stocky Indian Game cockerel with some fast growing hybrid hens, hoping to produce a tasty, quick, meat bird. In the first couple of years, they raised turkeys and geese for the Christmas market, which was very successful - the birds paid their way and brought in a little profit to put back into the project. It was a worthwhile experience, but proved to be a great deal of work for part-time enthusiasts - it's cold, you have a lot of birds to despatch, your hands are aching from all that plucking, there are still loads more to go, and you wish you were back in the warm with a mug of tea. So nowadays, they keep a few turkeys and a couple of geese for the family table. Through the door at the end of the greenhouse are a couple more surprises - a very productive looking beehive that keeps the family supplied, and a large water tank, fed from all the greenhouse gutters. Piped back via the barrel indoors, this keeps all the plants (and the poultry, through another auto-fed system) well watered. Amazing what you can do with a little ingenuity. This is a large set-up, which keeps this family pretty busy in their evenings and weekends. But you can see they love it - it is hard work, but when you are doing something you enjoy, and which fulfils your desire to live more sustainably, it's not like work. 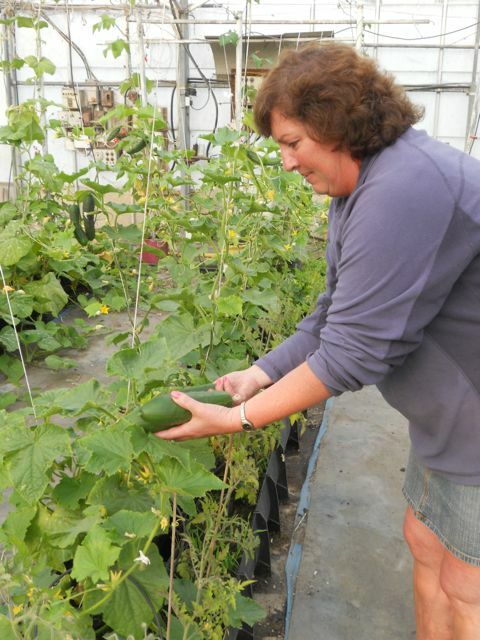 Claire's family know they are providing themselves with healthy, local, ethically produced food, and at the same time all sharing a rewarding hobby.